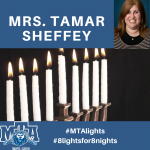 Today’s MTA Light is Mrs. Tamar Sheffey, Director of Guidance. When our students and families deal with difficult situations, Mrs. Sheffey is the light that guides them through these challenges towards the best possible outcome. Students say they enjoy hanging out in Mrs. Sheffey’s office because it’s a warm and welcoming atmosphere, a comfortable environment to say what they feel, and a great place to go for for guidance. “What many people don’t know, is that I majored in English Communications/Advertising at Stern College and thought that I would have a career in Marketing. After working in that environment and realizing how unhappy I was, I looked at what I was doing with my free time, which was working with high school students through Yeshiva University’s Max Stern Division of Communal Services. The MSDCS leaders, particularly Rabbi Barry Bender, inspired me to switch fields and go into Social Work with a concentration in Family and Adolescents. If you spend one day among teenagers, you’ll know why it’s important for high schools to have a Guidance Department. Teenagers face so much pressure – from school, family, social, social media – there are issues with friends and teachers as well as things going on at home that can include divorce or illness. Many times, teenagers don’t know where to turn for help. Every student can take advantage of having a Guidance Department. There are serious decisions that high school students make and having qualified professionals at their fingertips to discuss them with helps many students get through high school. The most important aspect of guidance is helping students stay calm and focused so they can look at the situation and see the real problem. Then we talk it out. Sometimes they just need a listening ear and sometimes they need more targeted help and advice. I love what I do and take such pride in my students as I watch them flourish in school and go on to succeed after graduation. My smile is the biggest when I see a student or family thriving after overcoming their challenges. I recently had a parent of a previous student come over and hug me. She said that her son, who had struggled a lot during high school, was flourishing because he had learned the tools to succeed from me and other faculty members and was now mature enough to use them. Parents have told me that their sons would not have made it through high school if it wasn’t for the help they received from the Guidance Department. Seeing students who have graduated on the YU campus or around my neighborhood as they continue to progress and grow brings me such joy.” Thank you, Mrs. Sheffey, for your constant support and guidance and for serving as a tremendous resource for our students and families.